Hey friends! I've gotten a lot of questions lately about how I manage my custom clients, so I wanted to share an incredible tool with y'all: HoneyBook. 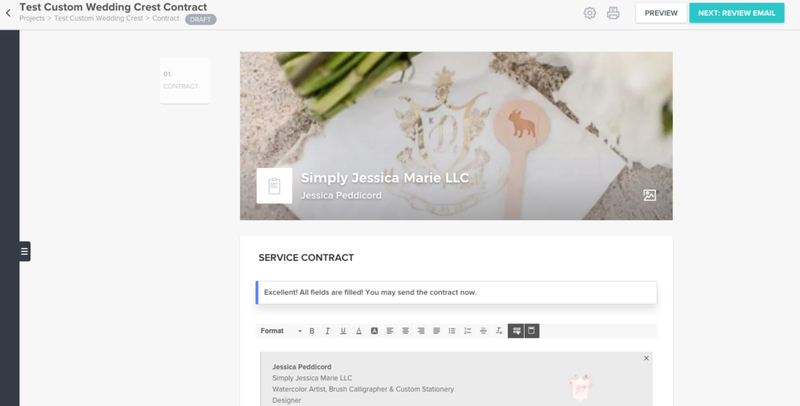 HoneyBook is the client management system I use to easily send invoices, contracts, timelines, and questionnaires - and it also has an amazing messaging center where I can chat with my clients (keeping our inboxes free!) and send design proofs. HoneyBook Free Trial & $200 Off! You can try HoneyBook for free for 7 days, and get $200 off when you commit if you use the button above! All of that sounds great, right? But if you're a visual learner like me, you might want to see what that looks like, so you can envision if it's the right fit for you. Well friend, here ya go! I'm sharing a peek into my booking & client management workflow with HoneyBook by creating a test project for you to see. Most of my clients commission their artwork through a listing in my online shop. Once their commission comes through, then I add them into HoneyBook. If your process is fully custom, you'd want to either send potential clients a brochure or a proposal first. Pro Tip: You can collect payments through HoneyBook - making it easy for you to stay organized, and helpful for your clients to have everything (invoice, contract, timeline, proof, etc.) kept in one place. I'll be using a custom watercolor crest commission as the example for this post! Once their commission comes through, I hop into HoneyBook and create a new project (aka, their client account) with all of their details. Pro Tip: Rather than using their wedding date as the start date, I like to enter the date timeframe as our design week. This helps me get a more realistic sense of my availability in my digital calendar via HoneyBook! One of my faaaavorite features of HoneyBook is their workflows capability. For each type of design project you work with, you can create something called a workflow. Take a peek at my Custom Crest workflow above to see an example! Schedule emails/tasks/etc. to be sent on specific days, after the previous step is completed, etc. Workflows essentially do all the thinking for me. They make sure I don't miss a step in my client process, which therefore enhances my client's experience! All while saving me time each day. Win-win! Time to make it official by sending them a contract! 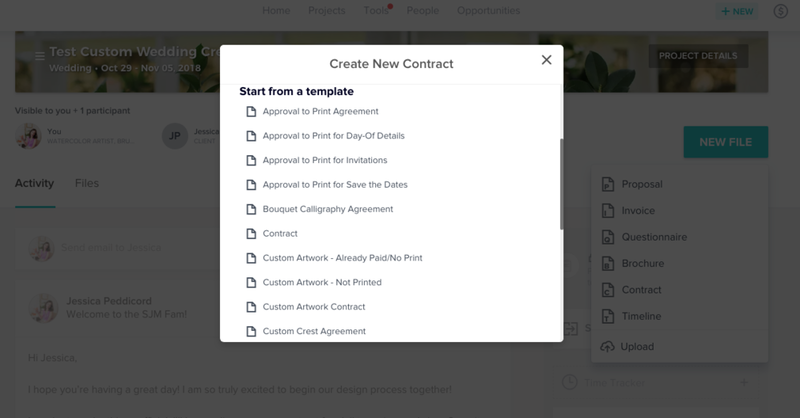 And you guessed it - both the contract itself and the contract email I send are both based on templates I created within HoneyBook. It just takes a couple of clicks to select the template I want to use, and I can further personalize the contract (if there are any unique aspects of our project) or email before sending them. It takes a bit of work up front to set up all of your templates, but it is so worth it once you've done it! Such a time saver. Once they've signed their contract, it's time for me to get to know more about these two sweethearts! It's full of questions about their personalities, their design styles, their hobbies, what they love doing together as a couple, what they're most looking forward to about their wedding and their marriage, etc. It's a fun first task for them to complete before we begin our design process, and it allows me to learn more about them so I can better infuse their personalities into their artwork! 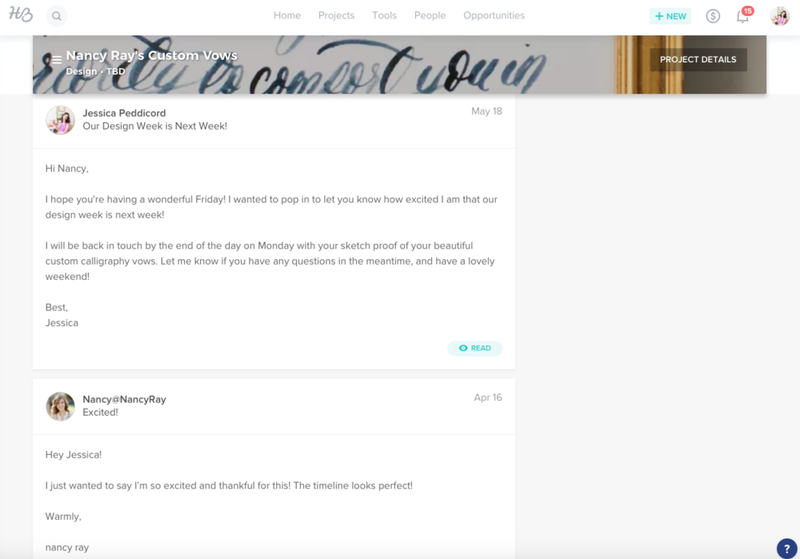 Bonus: If you sign up for HoneyBook and commit to it after your free trial, you will receive $200 off HoneyBook PLUS my new client questionnaire (perfect for wedding artists, stationers, and calligraphers!). You must use the button above to sign up, and then send me an email once you've officially committed to HoneyBook & I'll send you the questionnaire template! Pro Tip: The timeline's are honestly created with one day in mind (great for photographers or planners). To work around that for a week (or longer) timeline, I enter the date in the project title field, and then use the description field to explain what's due that day! I like sending their timeline from the get-go, since my design calendar is usually booked out 2-3 months in advance. That means that if a client commissions artwork in July, we likely won't actually begin working together until October. Sending them a questionnaire to get excited (the best kind of homework, that can be done over a glass of wine! ), and a timeline to let them know what to expect down the road makes them feel well loved on while they're waiting for their design week to begin. Once all of the logistics are taken care of and files have been sent, I keep in touch with my clients throughout the months leading up to our design week. I love sending an email the week before our design week to remind them that we're about to start - and I added that as an automated email in my workflow! I loooove the messaging center in HoneyBook - it's amazing to have everything kept tidy in one place. I use it to send design proofs (you can easily upload photos) and to get feedback from my clients. Once they approve of their finished painted piece, I've shipped it out, and followed up to make sure it arrived safely - our process is essentially done in HoneyBook! I can then move their project over to the "Completed" section in the pipeline. You might be thinking, wait - what's a pipeline? It's an incredible organizational system that shows you all of the projects you're working on, and what stage they're currently in. It helps keep me organized to see who I need to follow up with, who is in the planning stage (clients whose design dates are in the future), whose projects I'm actively working on, and which projects I've completed! Get a 7 Day Free Trial & $200 Off HoneyBook! Before I used HoneyBook, my organizational system was laughable. I had a non-interactive private "client page" (aka, an unlinked page on my website) to upload design proofs, communicated via email (long email chains that were hard to keep track of), and sent invoices via PayPal. While there might be nothing wrong with that - it was haphazard for me and for my clients. I finally feel that my client management system matches the professionalism of my business, and I've been able to connect with my clients on such a more personal level by using it, too! If it sounds like just what you need for your business, click the button below to test it out for free for 7 days, and get $200 off HoneyBook when you commit to it! Start your HoneyBook Free Trial! And before you ask - yes, I'd recommend it even if you're starting out - it will definitely increase your booking rate and word of mouth referrals from happy clients! Wouldn't it be nice to feel professional (and save loads of admin time) from the beginning? If you have any questions about HoneyBook, comment on this post or send me an email, I'm always happy to chat! I am an affiliate of HoneyBook, and may receive a commission if you use one of the links in this post to sign up for HoneyBook. I only share about tools I honestly love and use (which you should be able to see from this post! ), and I trust HoneyBook 100%.